Crystal Esprit, is the newest addition to the Crystal fleet, this elegantly appointed yacht has been designed to bring an entirely new standard of luxury small ship cruising to the high seas. World travellers who seek an ultra-luxurious and truly unforgettable cruise holiday will have all their wishes catered for with the exclusive Crystal Experience®. This sleek and sophisticated yacht is characterized by Crystal’s unique understanding of luxury and is designed to deliver an exceptional customer experience. 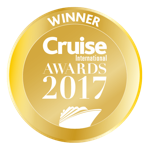 The hallmarks of the Crystal Cruises brand – service, space, quality and choice – will continue to thrive on a yacht that offers the best of all inclusive. Butlers for every room, six-star service and food, unique Crystal Adventures designed for a more intimate, exclusive feeling translating the World’s Best Ocean Cruising to the World’s Best Yacht Experience. Crystal Esprit will redefine Luxury Adventure in some of the most beautiful cruising areas in the world. Crystal Esprit perfectly embodies classic elegance with a mix of modern comfort throughout the vessel. Take in the exquisite views of an ever-changing horizon from the sublime comfort and privacy of your well-appointed suite. Each lavish suite is enriched with style, décor and amenities that accentuates the yacht’s unique character. All suites will include a custom designed bathroom featuring high-end finishes and modern technology enhance guest comfort; and a tranquil master bedroom and lounge area help travellers unwind. Complete with a personal butler and 24-hour room service, Espirit suites will provide a welcoming environment, of superior comfort where guests can relax and feel at home. Dinning onboard the opulent new Crystal Esprit is a luxurious culinary experience in itself. With Four delightful restaurants will be offering a whole host of the finest dining options. The Yacht Club Restaurant serves contemporary and classic specialties as well as innovative tasting menus created by Crystal’s award-winning chefs. , all using the finest and freshest local ingredients available; serving breakfast, lunch and dinner. The Terrace and Patio Café offer freshly prepared regionally inspired presentations of small plates, creative salads, gourmet charcuterie, cheeses and pastries. serving breakfast and lunch. The Pantry is the perfect indulgence, a self-service bistro and wine bar open 24 hours a day with a curated selection of drinks, light snacks and freshly baked pastries; to satisfy your cravings. Complimentary select fine wines, champagne and premium spirits throughout the yacht. One of the appeals of the Crystal Yachting Lifestyle is the unregimented environment, leaving you free to set your own pace, which is the ultimate luxury in itself. You can opt to explore on your own, join an active or cultural excursion with fellow guests, or simply relax on the deck while admiring the views. Guests will now be able to maximise their engagement with new destinations. With its sleek and nimble design, the Espirit vessel features a shallow draft that allows it to visit secluded harbours, coves and islands that are simply not accessible to larger cruise ships. Destination immersion and lectures from experts in s variety of different areas. The Cove Lounge is available for viewing movies, sporting events and more. Nightly entertainment in Cove Lounge will feature a piano player/singer. A dedicated fitness and activities director to assist you choose the right excursions and physical fitness activities. Crystal Adventures ashore, featuring both cultural and soft/extreme adventures, depending on the port. Special activities led by specialists, such as yoga, meditation, photography, even drone flying. Top-quality equipment, professional instructors, and the chance to try something new. The Gym comes complete with state-of-the-art Technogym ™ fitness equipment including treadmill, stationary bicycle, elliptical and Kinesis machines, as well as free weights. Crystal Esprit is the epitome of elegant cruising. The launch of the elegant 62-passenger vessel, will be bring a whole new experience of luxury on the high seas.